Phillip and Vicki Pepper have been members of Congregation Anshei Israel (CAI) for nearly 44 years. During that time, each of them has served as President of the synagogue’s Board of Trustees—the only couple to both serve the 88-year-old synagogue in this leadership capacity. 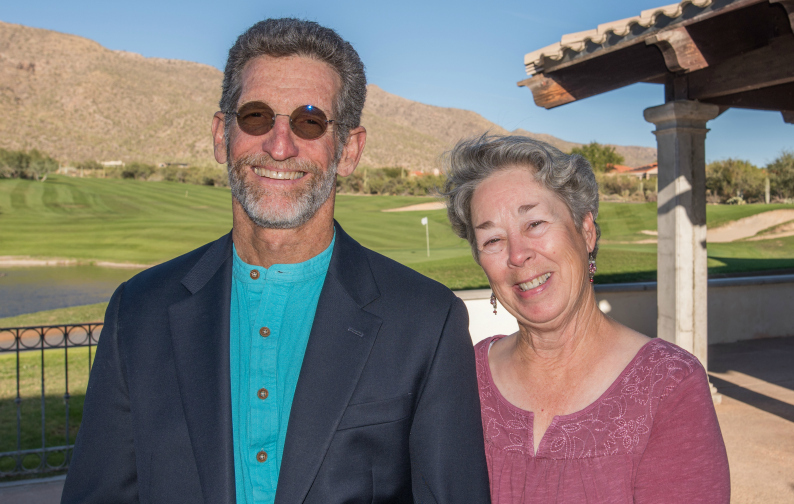 During Vicki’s tenure as Immediate Past President from 2000-2011, CAI participated in the Areivim Legacy Community Project, a two-year pilot program led locally by the Jewish Community Foundation of Southern Arizona (JCF). Participating local Jewish agencies and synagogues received training and support to help secure financial stability for future generations through endowment gifts. When Phil served as President from 2015-2017, he helped re-ignite the legacy partnership with JCF after the Congregation’s Board included “identifying a sustainable revenue model” as one of its priorities. Board members and other Congregation leaders now host intimate educational events in their homes, inviting friends to enjoy a social gathering and learn about current legacy giving as well as endowment opportunities. Educational programming is also in the works for congregants in CAI’s Synagogue Life Council meetings, where leaders focused on the programmatic side of the synagogue’s activities, will share the same opportunities.